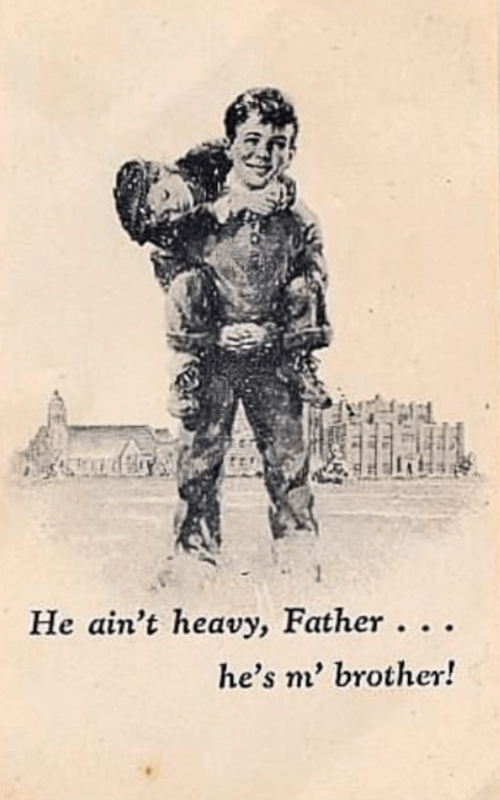 The Weight of Love – Heavy or Light? Their love, they thought, was an iron-clad statement, fixed to the grill work of Pont des Arts bridge in Paris. Etched with their initials, couples professed undying love as they tossed the key to their lovelock into the Seine. City workers in 2015 with a crane and wheeled dollies have dismantled the wire mesh panels – why? To preserve the bridge structure endangered by the weight of the lovelocks. Bridges in cities around the world, including New York feature bridges laden with similar locks of love that will soon feel the bite of steel shears. Love, the most passionate emotion on earth, has weight, both literal and emotional. Once when I had remarked on the affection quite often found between cat and dog, my friend replied, “Yes. But I bet no dog would ever confess it to the other dogs. Your thoughts on the weight of love, the pain of loss, the toll each takes. A sweet comment about chocolate . . . ? Follow-up: Comments are now open on last week’s blog post about my mission statement. If you wish, you can reply here: Thank you! It’s sad about the love locks, but safety first, I suppose. Oh, what a romantic quote, that Winnie the Pooh! You must be on pins and needles with your romantic novel coming out in just DAYS! I’m so excited for you – truly! As always, you weave together interesting and surprising images and words. I’m thinking of the weight of maternal love right now, and I know you feel the loss of your earthly mother on days like this. Mother turns 90 in 13 days, and we children and grandchildren are bustling about, hoping to make her day special. That kind of work takes time, but it doesn’t feel heavy. She’s our mother, after all. I noticed your extending the pun on the Boys Town image since made into stamps and seals on mugs. Thanks for helping me reminisce as I remember planning our mother’s 90th. It was combined with Aunt Ruthie’s, so it became a double pleasure. It’s a lot of work, sort of like doing a wedding-lite, but your mother can appreciate it all with mind, body, and spirit. And she will! And I’m glad you are surprised by the photos. I believe the New Yorker cover caught my interest first and then the “quilting” bee began, much like I observe on your posts. Thank you, Shirley! As always, a very interesting blog post, Marion. I’ll have to keep an eye out for “love” locks! And a Happy Valentines Day to you and yours. I think I saw photos of a heart trivet on your blog. Right? Happy Valentines Day to you too, Lynn. It is better to have loved and lost than not to have loved at all. Yes, there is a price but it is worth it! I think of my parents and the love they shared for over 60 years which continues, even though one is no longer on this earth. The ability to love and to be loved is the greatest gift of all. Hope you had a lovely Valentines day. Ah, your reference to your parents long marriage is a wonderful reminder that love is eternal. My parents made it to # 44, but then Daddy died. And your restaurants in Spain are probably in festive mode now, but here in the States many are just now gearing up for intimate Valentine dinners this evening. Thanks for being among the first to comment today, Darlene – thank you! The love of my mother was one of the lightest, most buoyant and joyful things I carried when she was alive. Her death, all these years later, still weighs heavy. But I carry it with gladness because it meant that I loved and was loved. Happy belated Valentine’s. When Pablo and I say we were married 30 years people get surprised. I praise God for my husband for his life and commitment to me our children and grandchildren and our one great-grandchildren. Yes never a dull moment. We work very good together. I tell my granddaughter’s find a man with your grandfather’s quality who will bring out the best of you. Support you through your failures and accomplishments. They are out there. I pray that all would find their love and happiness. Modeling a happy marriage is the best way to ensure that the pattern will be repeated in your children and grand-children, as you and Pablo have done. I guess we can say that you and Pablo are love-locked! You extend her life with your positive energy, Laurie. She would be so, so proud of you, pots boiling everywhere on your creative stove these days. Our loved ones who have already left this earth are experiencing this promise. To us it is still a mystery, but someday. . . I hear echoes of the blessed hope in your comment here, Elfrieda. Just now a melody based on this text: “I Know Whom I Have Believed” wafts through my mind. Thanks for your contribution here. I did not know that about locks around the world weighing down their bridges including the famous one in Paris! Where have I been? But your post reminded me of something I could post for Valentine’s Day which will be up on my FB page later today, as a surprise for my Valentine. In other responses, your box of “postcard” chocolates from Europe remind me that I still have some in a drawer somewhere, from Belgium. Probably no good anymore! I’m always happy to surprise, Melodie. Before we went to Ukraine I had never heard of love locks either, so no need to be embarrassed. 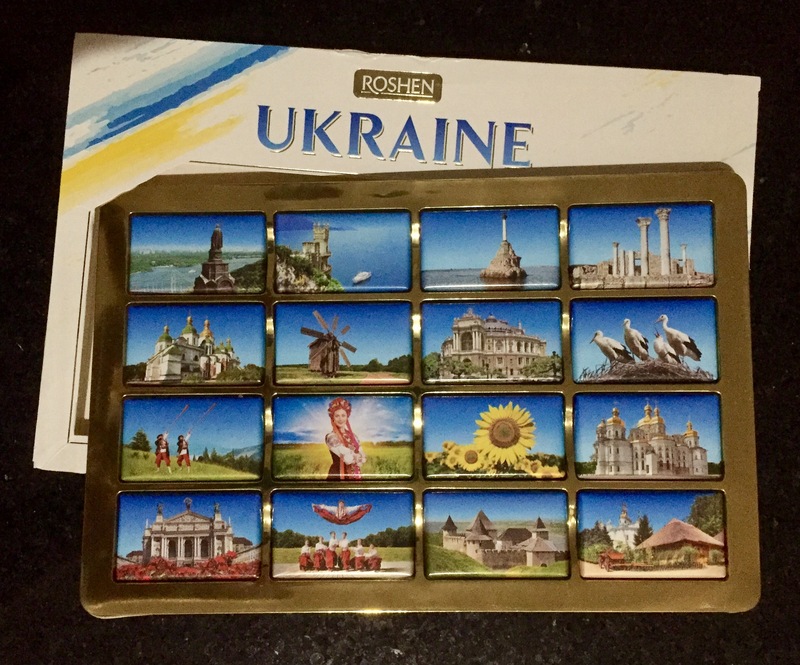 About the box of sweets: In January my friend from Kiev gave us this box of chocolates. They were gone within a week. Obviously, chocolates don’t last in our household. My parents were married in Elton, Maryland on February 14, 1942. That love did not sustain itself for all of their married years is very sad. Love can be so many things all at once and I’m happy to say my Valentine of 53 years is still with me and we cherish every day together. I am one of the most fortunate lovers. The struggles in your family of origin did not forecast doom for your own love match. You are fortunate because you and Bill together made your marriage work. That’s a triumph, Joan! 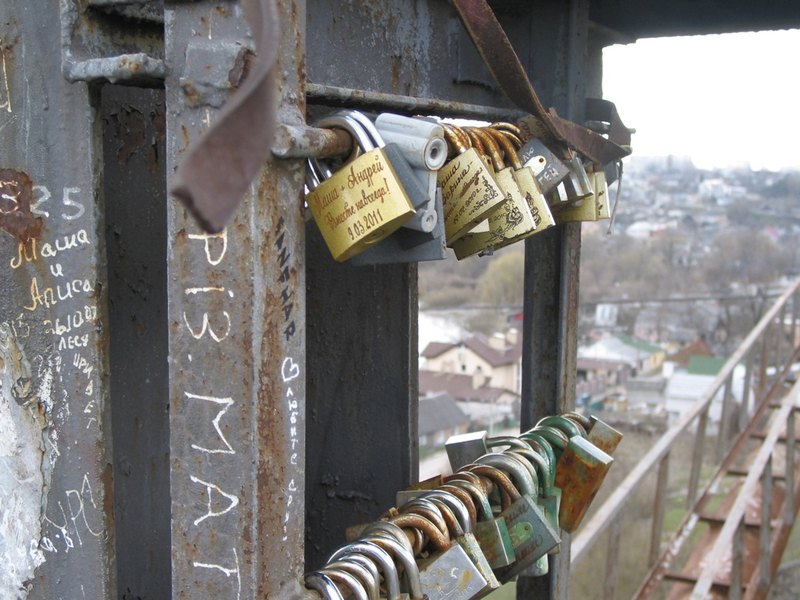 When Marian and I were walking on that bridge in the Ukraine I found the locks not only photographically appealing but comforting to know that many other couples had also considered their marriage vows important enough to make this visual statement. Two lives locked together by love. Happy Valentines to my love, friend, writer and partner. I am happy to approve this comment in WordPress – and in life. Thank you, CareBear! The love lock thing came to Australia quite a few years ago. We’ve seen them on fences overlooking scenic views, small bridges, and especially large bridges. It took me a while to work out what they were at first, then I thought, ‘How lovely!’. But there is always a downside I suppose, as shown by the Paris bridge. Maybe you wise Australians will learn from others to do things in moderation: lighter locks, more bridges, more fences? Thanks for stopping by with a comment from Down Under today, Linda! You are full of surprises, Marian. I did not expect to see your post today, and I didn’t get a chance to respond earlier. It is lovely and filled with love, as is fitting for the day. I knew of the bridge in Paris, but not the others love lock bridges. We’ve celebrated with a lot of chocolate in the past few days–one of the February birthdays plus Valentine’s Day. Cliff’s comment is very sweet. <3 Hope you both had a wonderful day! I came around the bend a day sooner because the theme matched the day. Indeed, life is like a box of choc’lates, made sweeter with all the family sharing I see in your musings and on Facebook. We are blessed, that’s for sure! Here’s to faith, hope and love! You have all three in abundance. That’s how and why you can inspire others. I’m glad you learned something new about lovelocks. I saw lovelocks first in Ukraine and then perked up when I saw them pictured in Paris and New York City. Ah, the power of love! Thanks, Kathy. The last quote is from Tennyson’s In Memoriam, a tribute to his dear friend, Arthur Hallam. I glad you enjoyed the potpourri of quotes and photos here and stopped by to say so. Thanks, Susan. You see the lovelocks and their having to be taken down as a metaphor too: love as both heavy and light, a burden and a treasure – often true. 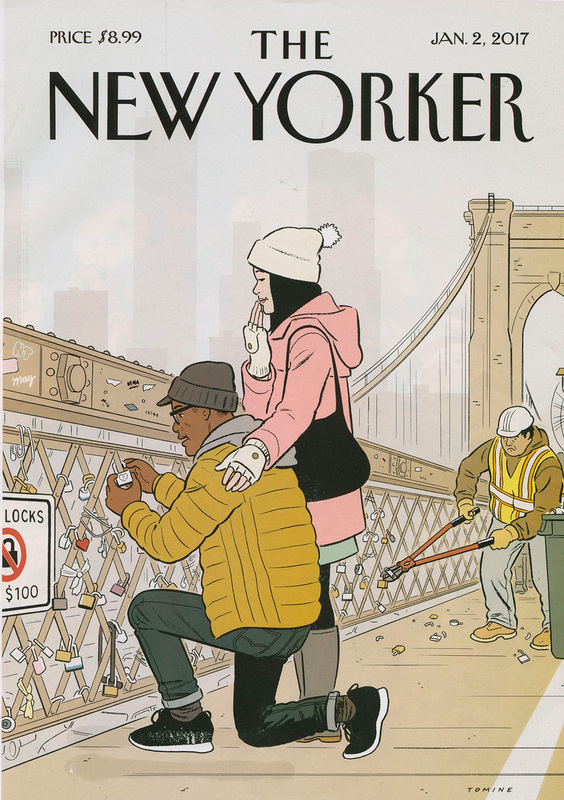 Marian, I enjoyed the post and the metaphor of “love locks”. The older I get – with the exception of my two amazing sons – the less apt I am to invest in other people; like Buddha said, true freedom/enlightenment comes when we divest ourselves of all attachments, material and personal. Most people, I have learned, are self-centered, often dysfunctional and disappointing and men in particular are interested in controlling women. Perhaps, the love I once felt for my late husband was all the love I ever needed and, in that regard, having once had true love, I feel blessed and wrote lengthily about him and me. But, of course, his death was a huge weight of loss and forever changed the trajectory of my own life. As Julian Barnes said, “For loss, there is no remedy.” So back to Buddha . . . .
As your book demonstrates, you and John had a precious love, with those amazing young guys Alex and Daniel to carry on the legacy in their own fashion. I am looking at your personal note to me in “A Portrait of Love and Honor” where you said in a postscript, “If you ever get to PA, let’s meet.” I’m happy we’ve met and our paths have crossed in other ways since then. I think you have a healthy attitude toward love and loss. Many women do not experience true love even once. I appreciate your Julian Barnes quote . . . . Thank you, Marian. I am very happy we met in person, and continue sharing our lives and our writing journeys. Your friendship is a gift. Thank you for such a relevant post on valentine’s day. My feelings are poignant but not yet ready to be articulated. Welcome to my blog, Beth. I sense strong feelings here. It’s okay that you are not ready to express them just now. Thanks again for reading and taking the time to comment. I saw some of these love locks in Germany and Austria a few years ago. Have never heard that they could cause problems for bridges, though. Seeing your name here reminds me of my introduction to you through your memoir Hutterite Diaries. I did not know about lock locks in Germany and Austria. Apparently they are all over Europe. I’m glad you learned something new here. Thanks, Linda! Why is it that Winnie the poo quotes are always the most sensible , don’t you just love them Marian . If it was possible ( you will laugh at this ) I would like Poo as my ‘Daily’ 😁😁Do you remember some weeks ago we talked about having a ‘Daily…’ such unadulterated luxury , not for the laziness of it all , the chats and the joy of looking at the world through different eyes would be enough … like we do I suppose. Oh, Cherry, I didn’t laugh at your clever idea for Poo as my daily, but I did smile. Until that happens, I’ll strong arm my husband to help with chores. I call him my CareBear anyway. Besides he always makes the bed in the morning. I could con him into more, don’t you think? Very deep! And the perfect topic for Valentine’s Day. Sometimes I think chocolate is better than love!!! I’m sure it’s not, but I’m on a diet, so it’s been a while since I’ve had GOOD chocolate. Maybe chocolate would equate to love if someone you care about gives you chocolate. This morning I bought some Moser-Roth dark chocolate with 70% cocoa. Maybe I’m deluding myself, but somehow I don’t think it violates my diet. Thanks, Stephanie! Great photos. Great quotes. Just wonderful. Thank you, Marian. I have read your comment more than twice, letting the meaning of the weight of longing sink in. I’m guessing you refer to longing for lost love. Yes? More than most men, C. S. Lewis was in touch with his feminine “anima” side. An astute scholar, I too love his whimsical side in the Narnia Tales and then his capacity for passion in Surprised by Joy and The Problem of Pain. Can you tell I’m a fan too? Love is very weighty, and love shouldn’t be locked up. For love to lighten up, we give our lover freedom to float away. And thus, he/she stays right where he/she is. (I just made that up, but it seems right to me.). And C.S.Lewis, from what I remember, went into a deep depression upon the loss of his loved one. Not sure he ever got over it. But I feel certain he still would have not wished he never had that love. You are blessed with the ability to be succinct, Pamela. I notice it in your own posts and now in your comment here. I agree that Lewis probably never regretted loving Joy. But he did say “it is easier to say ‘My tooth is aching’ than to say ‘My heart is broken'” maybe because there is no cure for a broken heart. Or is there? A lovely feast of thoughts! Thank you for commenting here, Fiona. I enjoyed your photos of emerald glory on your post today. I read Four Loves long ago and like Mere Christianity by the same author, it had a big impact on me. Thanks for bringing it to my attention once again. I think I should like to read it again all these years later and see if what I have learned since makes a difference. A 35 year marriage with all of the ups and downs has been my most perfect teacher. It is, by far, the heaviest and the lightest of loves I’ve ever carried. So much sorrow, so much joy, never enough time to digest the gift of a lifetime. Dorothy, I say Amen to all of that. After awhile, doing the right thing in spite of differences gets to be a habit. I loved your hilarious post today about your romantic getaway. And the format – very stylish! I have not heard of these love locks. Here, love locks are when someone has long hair and goes and has put into a braid and then cut off and collected for the agencies that make wigs for those who have lost their hair. That sounds like a better demonstration of love to me. Thanks for visiting here and leaving this wise comment, Athanasia. I’ll have to second that comment about the chocolate! I bought some more this morning, the dark chocolate of course, 70 % cacao. Thank for your sweet comment, Rebecca!